Two separate things, really: in the main it’s a modern, media-heavy exhibition ... or rather an "experience", as they like to say these days in the marketing of such places. As the name implies it's about Berlin's history, but with an emphasis on the 20th century, and that includes all the relevant dark periods. 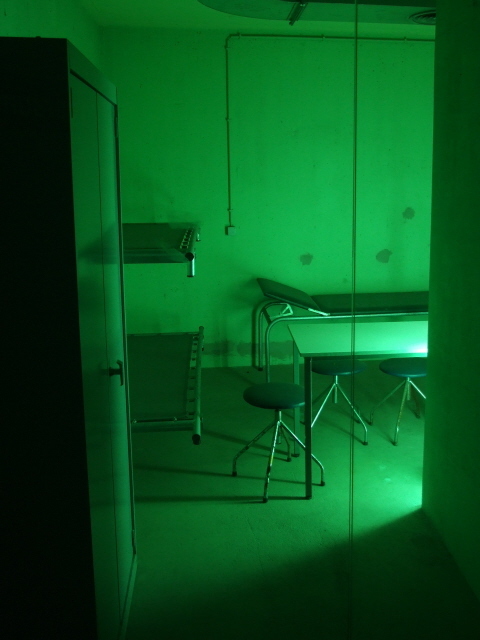 In addition, a guided tour of an underground former nuclear bunker is on offer, which has an even more pronounced spooky slant. Note: do not confuse this place with Berlin Story! 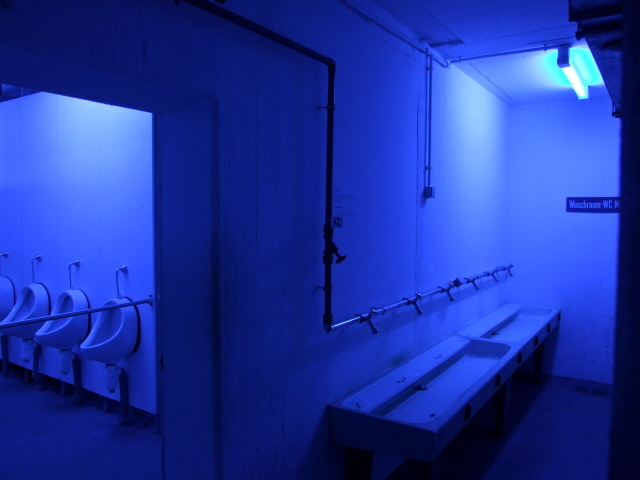 What there is to see: Quite a lot – a guided tour of a nuclear bunker, and a highly multi-mediarized "experience" exhibition about the history of Berlin, which includes various periods of relevance to the dark tourist, but also a few less relevant sections. 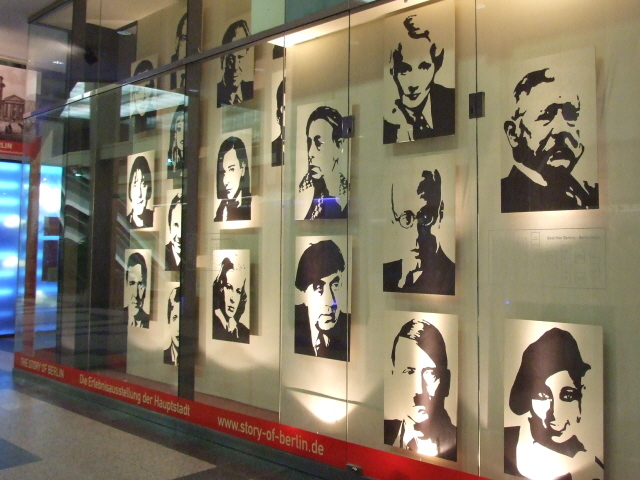 First you have to navigate your way into the shopping centre that the exhibition is located in, past a wall of crude photo portraits on perspex showing famous, not so famous and totally infamous Berlin residents of the more or less recent past – including the grim grimace of the most infamous ever: Adolf Hitler (who was not a Berliner, of course, but from Austria, but whose reign of terror was seated in Berlin). The entrance to the exhibition is just round the corner. Check the times for the bunker tour first, if you want to go on one, and then either wait for it, or do the exhibition first and come back for the tour. When I visited in January 2010, I timed it so that I would go on the bunker tour first, so that I could spend as much time as I liked in the actual exhibition. 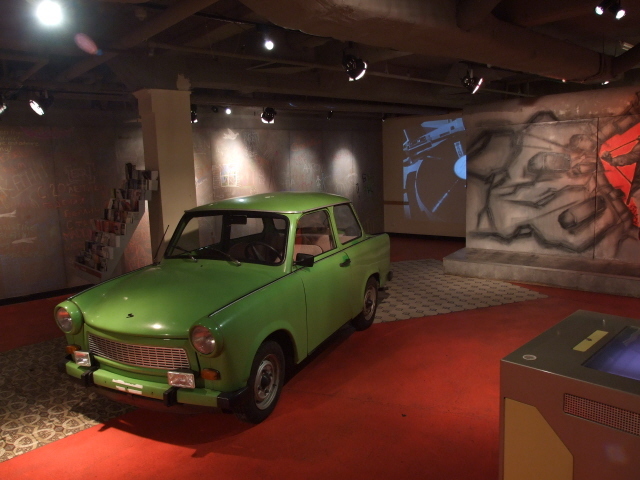 While I waited I just had a look around the foyer area, which already functions as a mini-exhibition of sorts, complete with a fake stretch of Berlin Wall and one of those almost obligatory Trabbi cars (as a symbol of the GDR). Then the bunker tour commenced. 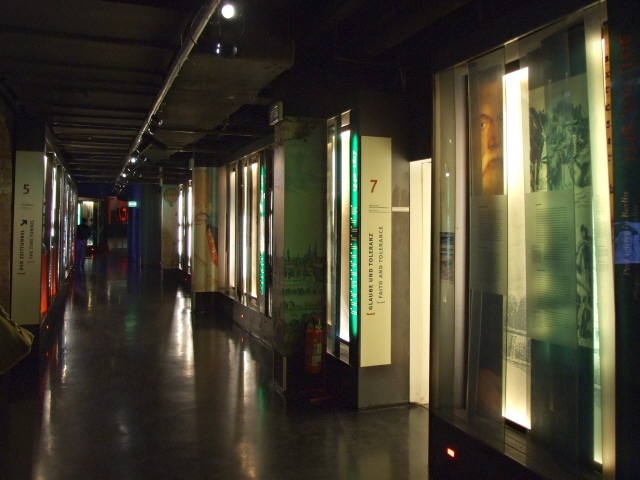 The bunker is not directly connected to the exhibition. Instead you are first led along a different corridor of the shopping centre and out onto the street – which was icy and cold when I visited, and I had left my coat at the exhibition's cloakroom. But you only have to turn one corner and then descend some stairs next to the entrance to the underground car park. 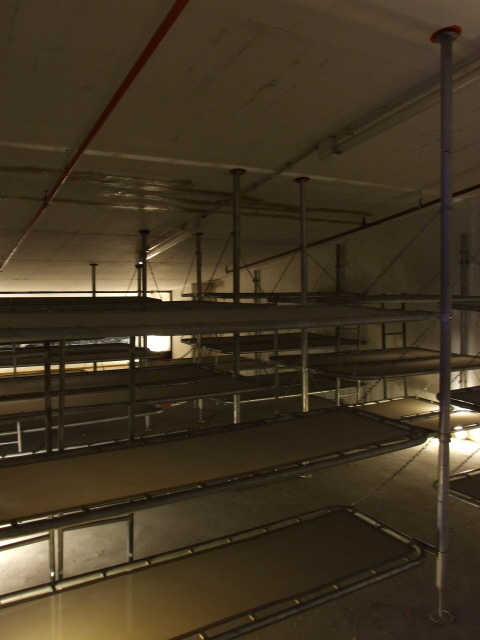 This Cold War era "nuclear bunker" is in actual fact just a modified underground car park itself, so it's more a fallout shelter than a bunker proper. 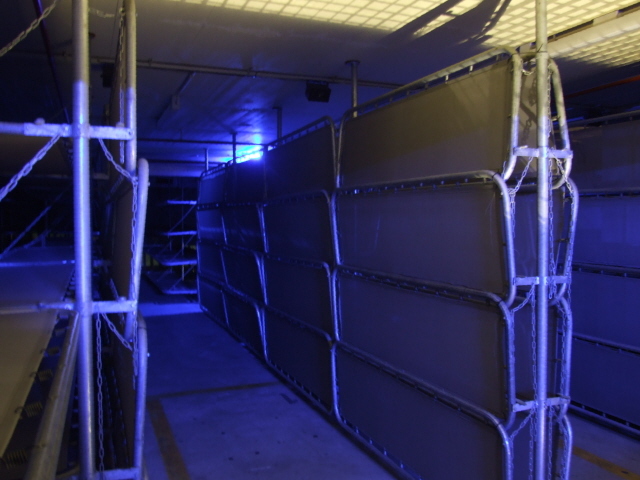 It's said to be still functional and could provide space for up to 3600 civilians "in a crisis", namely on rows and rows of flap-down metal bunks. 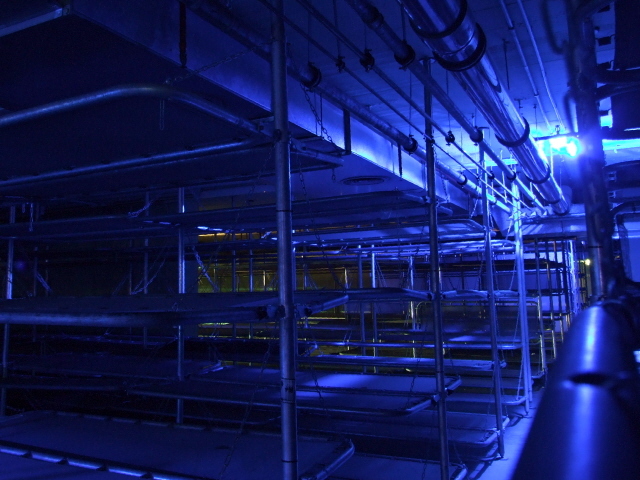 The parts you get to see on the tour are "enhanced" with spooky coloured lighting (mostly a deep blue). 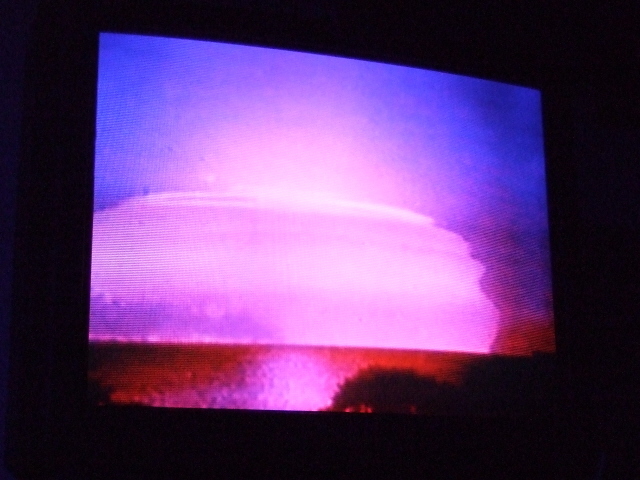 Along parts of the walls, a series of TV screens provide further "enhancement", namely through sequences of nuclear testing and other documentary footage, some even with a soundtrack, but the tours do not stop at them to take the words in. It's all rather meant as atmospheric background. 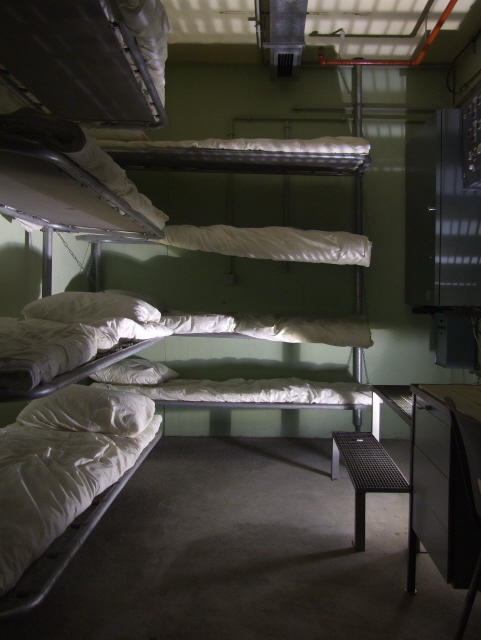 In addition to the bunks you get to see special rooms, e.g. 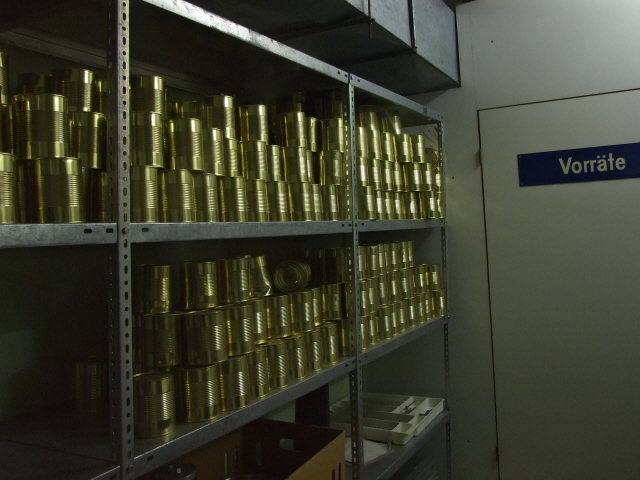 those for emergency supplies, a kitchen, a medical room, air filtration machinery, and door mechanisms. 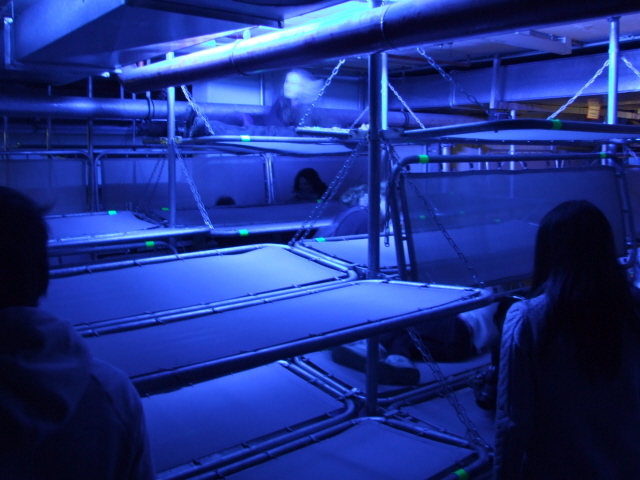 Towards the end of the tour you can even have a test lie-down on the bunks. Then it's back to the entrance. These bunker tours are available in German and English (other languages only on request) – and I had deliberately picked the latter, precisely in order to ascertain how well it's done in English. The verdict: mixed. The guide struggled a bit with her English, especially with pronunciation and on a few occasions with vocabulary too, but managed to muddle through more or less alright. There weren't many questions from the mixed lot of international tourists so the challenge was limited (though I wondered what would happen if you got that American type of talkative tourist showering the poor guide with questions …). The main thing, anyway, is seeing the place, and that is only possible with a guide. The information from the narrative isn't all that crucial, especially if you've been on a bunker tour before (e.g. with the Berliner Unterwelten, who have otherwise more or less cornered that slice of the dark Berlin tourist market). Some Japanese members of the group I was on hardly bothered with the spoken words and concentrated on their photography … and I admit that on some occasions I did so too. Why not. This is a highly commodified affair using lots of multimedia to "enhance" the "props" (there are only a few original artefacts). You're often surrounded by sound and visually it's also heavy-handed. This has attracted some criticism, and I admit that when I went I half expected an overly "Disneyfied" approach. While this cannot be disputed altogether I was still positively surprised. It was better than I anticipated. It is of course not your traditional info-heavy museum-style exhibition, but an "experience" (I despise that marketing buzzword! ), so don't expect much in-depth factual coverage. It's more a sensory approach. At least you can walk though, self-guided, at your own chosen pace. For the dark tourist, it's likely that the initial sections of the exhibition can actually be paced through rather quickly: from Berlin's early (founding) history through to the days of Prussian rule. The first really darker section is that on World War One. 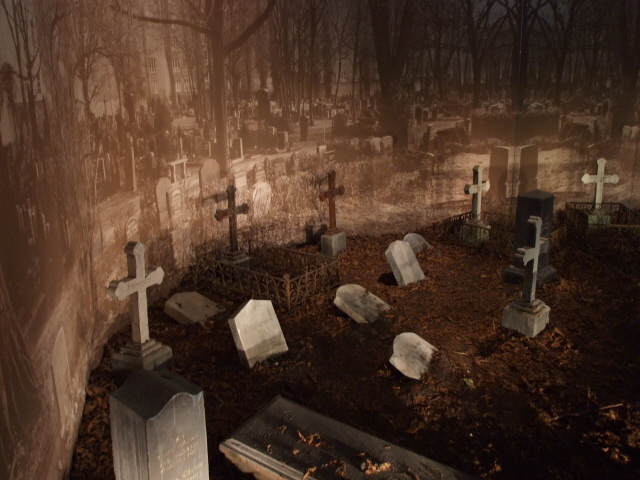 A mock cemetery installation provides a bit of gothic sinister atmosphere. After that, you can amble through the 1920s, which has its fun bits, but is not of any particular dark interest (and could thus even be skipped altogether if time is short) … until you get to the stairs to the lower level. Here it gets very dark indeed quickly: this is the section about the Nazis' rise to power followed by WWII. 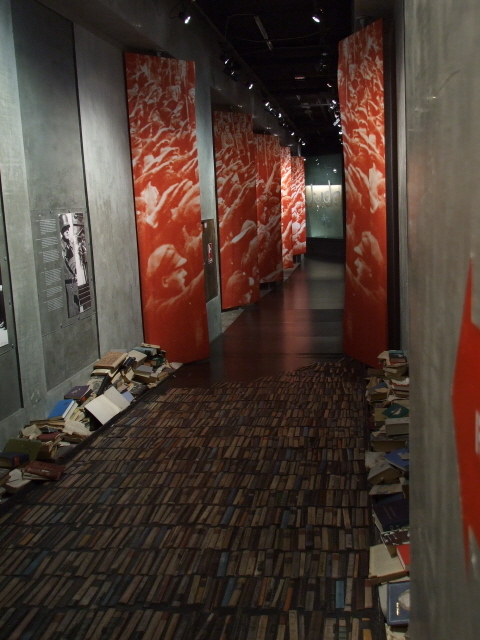 The book-burning and propaganda is covered as well as the early persecution of Jews and political opponents (especially at Plötzensee prison). A timeline briefly summarizes the course the war then took. A particular emphasis is also on what the war meant for Berlin, in particular in the form of the increasingly devastating Allied carpet-bombing raids on the city, which left many citizens homeless (if not worse). 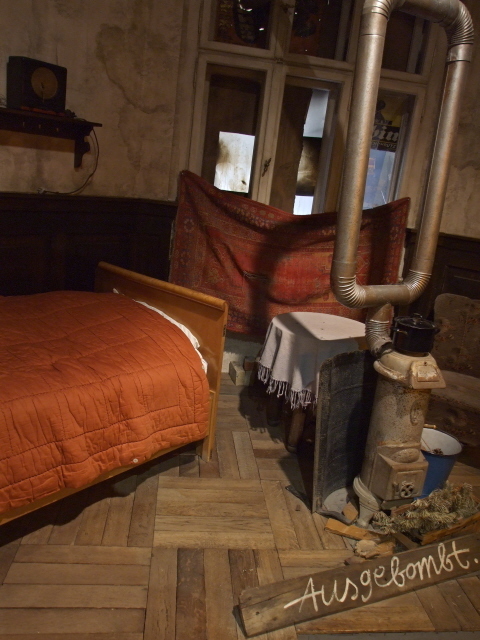 A display of a recreated "living room" in a ruined building aims at capturing the atmosphere of the day (and in case it's not quite sufficient, a sign says "ausgebombt" – 'bombed-out'). The end of WWII is of course also the beginning of the period of a divided Berlin – and also that of the larger scale confrontation between East and West in the Cold War. 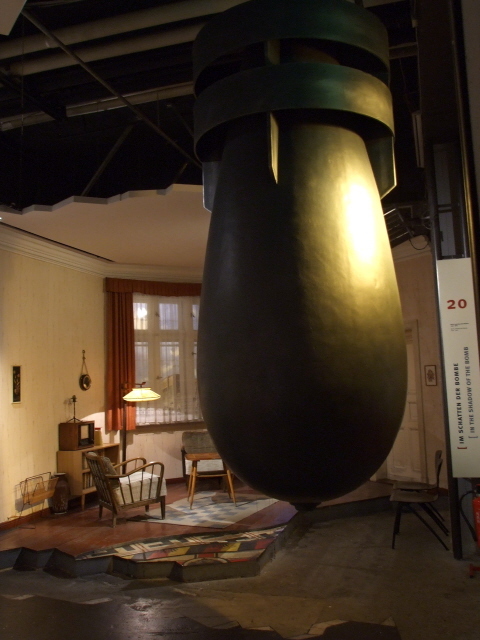 One of the many walk-through display rooms features a huge (if somewhat comical looking) bomb model to symbolize the threat of nuclear Armageddon that the world, and especially Berlin, faced at that time. It's strangely contrasted with a life-size diorama of a typical living room with 1950s furnishings – in that familiar, depressingly stuffy design of the era. The Berlin Wall is predictably given prominent space and coverage too. 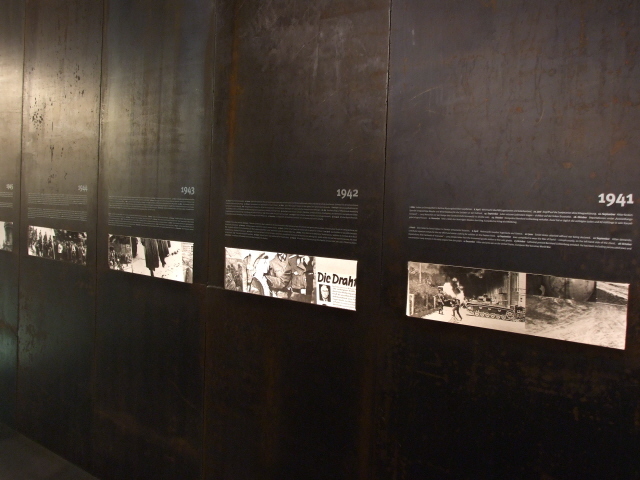 The surround soundscape includes the famous passage from a speech that the then head of the GDR government, Walter Ulbricht, made shortly before the border was sealed off: "Niemand hat die Absicht, eine Mauer zu errichten" ('nobody has the intention of erecting such a wall'). It's a much-quoted lie – but its being played here in a continual loop can get on your nerves a bit. 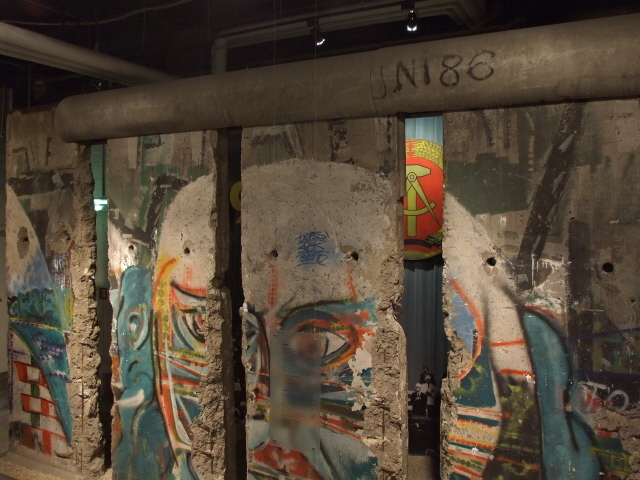 There are also a few sections of graffitied Berlin Wall. 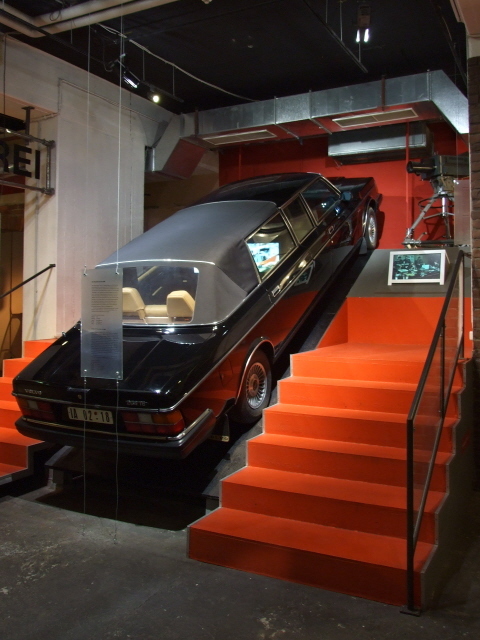 But the most intriguing original artefact in this part of the exhibition is the black Volvo "state carriage" used by the GDR politburo on representational occasions. 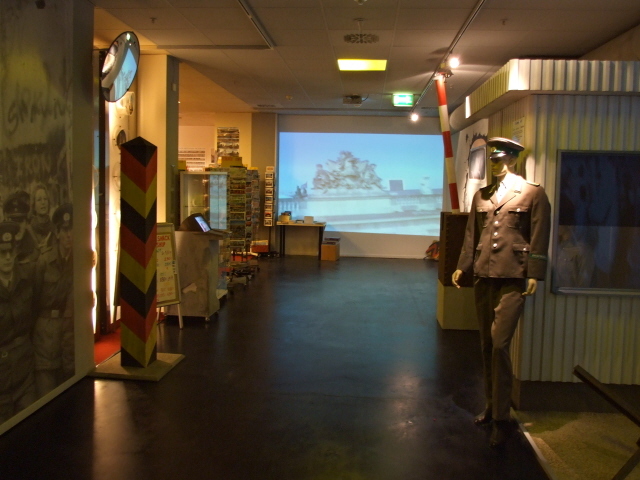 At the end of the exhibition, en route to the extensive shop, one has to pass a mock-up of a border control point – with a sound recording asking anyone passing for "identification" – in German only. Speaking of the issue of language: signage and text panels are bilingual, German and English. The quality of the translations into English are not flawless but more or less OK. The sound recordings including spoken words, however, are in German only. The shop may be worth a look too, amongst all manner of typical souvenirs you may also find some worthwhile information material, some in English too. 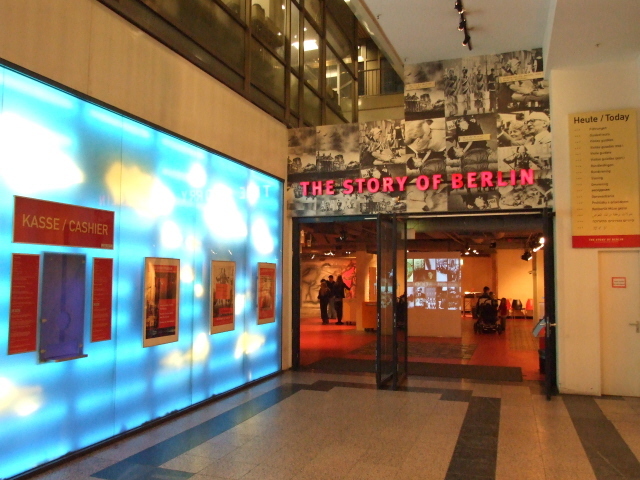 The best outlet for such material, however, is the very similarly named publishing house and shop in Mitte: Berlin Story. Overall: only part of the exhibition may be of interest to the dark tourist, and the manner of presentation/commodification may not be for everyone, but at least the sections about WWII, the post-war era and divided Berlin as well as the GDR bits are a worthwhile addition to visiting the more authentic sites (see under Berlin). 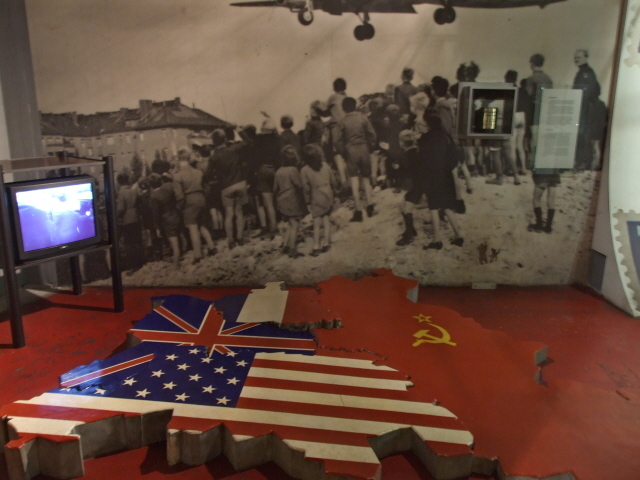 And for those with a particular interest in all things Cold War, the guided bunker tours are a special bonus. Another note: when I visited this place (January 2010) it was totally off-season, in the middle of an exceptionally snowy winter, and late in the afternoon. This had the benefit that there were comparatively few other visitors about, which I found very pleasant. At times I even had the odd exhibition room totally to myself. At other times/seasons, this is most likely to be very different, especially given that the exhibition is popular with school groups. (Incidentally, groups of more than 10 have to pre-register! Phone: +49-30-88720100) In fact, the official recommendation (and mine) is therefore to consider visiting in the late afternoon (from 4 p.m.) rather than the morning in order to avoid the most crowded times. Location: at Kurfürstendamm 207-208, right on West Berlin's main avenue. Access and costs: easy to get to; mid-price, above average for Berlin, but not too excessive. Details: the exhibition's address is easy enough to find, it's only a few steps west from the metro stop Uhlandstraße (U1 terminus) on West Berlin's main street. A number of useful bus lines also go along this street, providing connections to the hub of Zoo station, from where virtually any part of Berlin is within relatively easy reach. Walking down the southern side of Kurfürstendamm, roughly opposite the "Hotel California" (it's really called that! 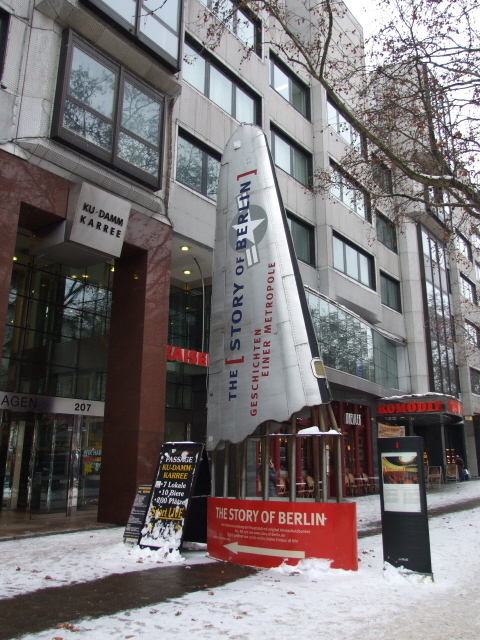 ), look out for the upright plane wing marking the exhibition prominently enough (with the USAF symbol on it at the top – apparently it's from a Berlin Airlift cargo aircraft) and follow the red signs. The actual entrance to the exhibition is ca. 50 m inside the Ku-Damm Karree shopping centre. It's signposted sufficiently, though, and hard to miss when walking past. Admission: 12 EUR (concessions e.g. for students, seniors, groups: 9 EUR; 5 EUR for children under 14, under six years free); the fee includes the tour of the bunker. Opening times: daily 10 a.m. to 8 p.m. (!) 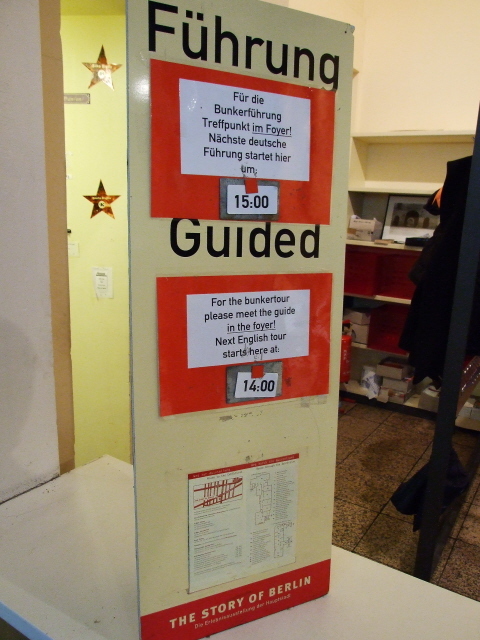 – last admission 6 p.m.; guided bunker tours take place every hour on the hour, alternating between German and English. In high season, tours are offered more frequently. Time required: the "expected" visitation time seems to be a minimum of two hours – going by the last admission time before closing. But that's only if you really want to take in everything. For the dark tourist there are several sections that can be either skipped altogether or just briefly skimmed, so that less time may do. The guided bunker tour will only vary in length depending on how many questions are asked by the participants. The tour I was on was over within ca. 30 minutes. Combinability with other dark destinations: See under Berlin – given the generous opening times of the exhibition, esp. being open as late as 8 p.m., it can easily be added on to a day's itinerary at the end. The nearest other dark tourism site is the Kaiser-Wilhelm-Gedächtnis-Kirche, which is within walking distance. For other sites further away, the metro (U1 terminus at Uhlandstraße) provides access to the rest of Berlin. Combinability with non-dark destinations: arguably, the location right on the famous main boulevard of West Berlin, Kurfürstendamm, could hardly be better, though personally I've always found this street and the area around it rather underwhelming. Beyond Kurfürstendamm's eastern end, on the other hand, Berlin's superb Zoological Garden is a definite recommendation. Otherwise you have to head further towards the central district of Mitte for the majority of the city's further premier tourist sights – see under Berlin in general.